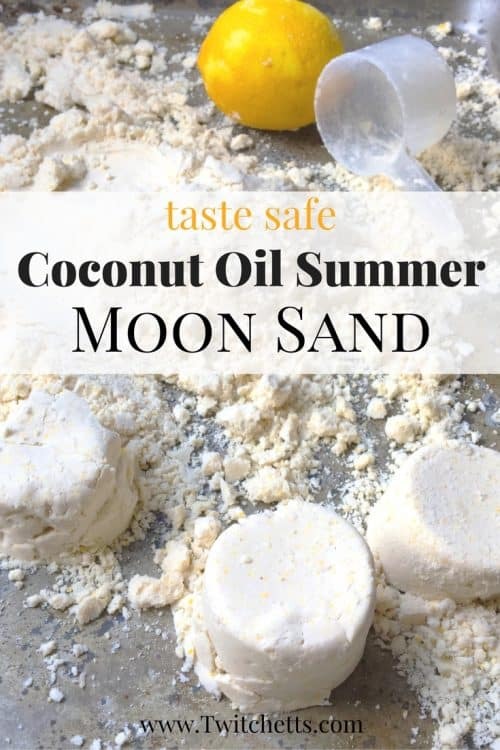 This simple moon sand recipe uses coconut oil. We then sent it with taste safe ingredients. 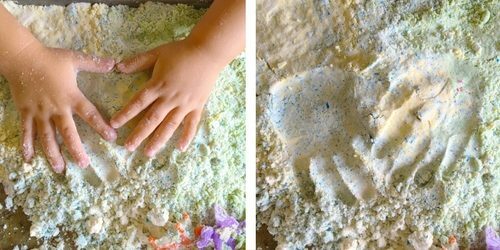 It’s the perfect sensory activity for kids of all ages, even toddlers! 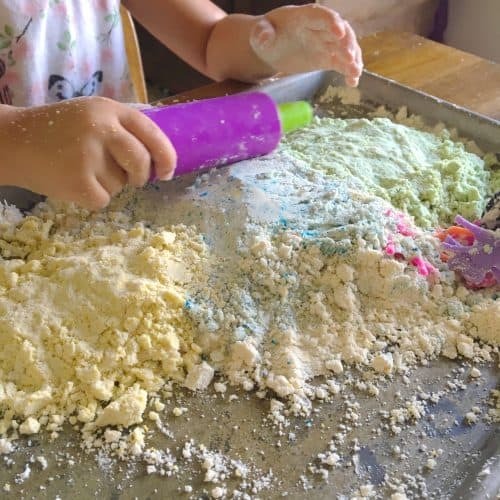 Whether you call it moon sand, cloud dough, or kinetic sand it is a fun sensory experience for kids of all ages. 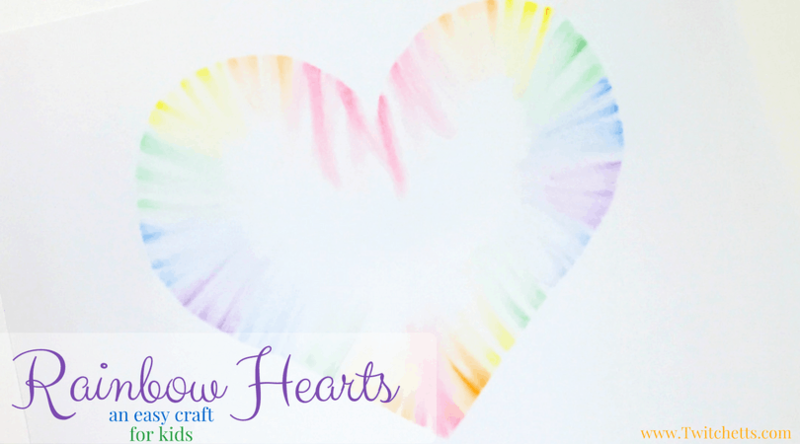 You can find lots of different recipes around the web on how to make your own at home. After reading quite a few, I knew I needed to come up with something a little different. 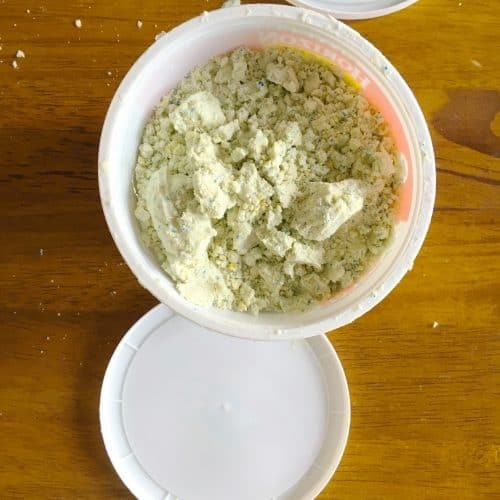 My version, a coconut oil moon sand with a summer twist. 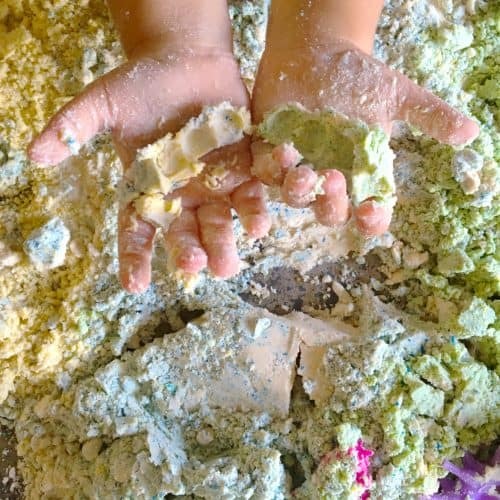 Ever since doing research for the book I co-authored, The Undeniable Power of Play, I know how important sensory play can be for a child. I also learned how engaging multiple senses is even better. Since I wanted to let V take the lead with this medium, I wanted to make sure it was a taste safe moon sand. 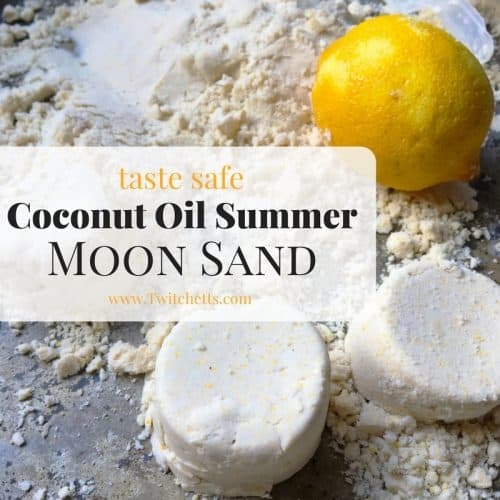 With all of these things in mind I came up with my own coconut oil moon sand recipe, and you’re going to love it! Yellow food coloring. Or the color of their choice. Measure out 2 cups of flour. 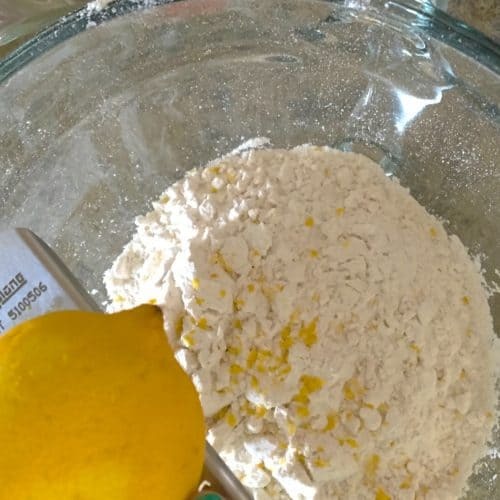 Zest your lemon right on top. 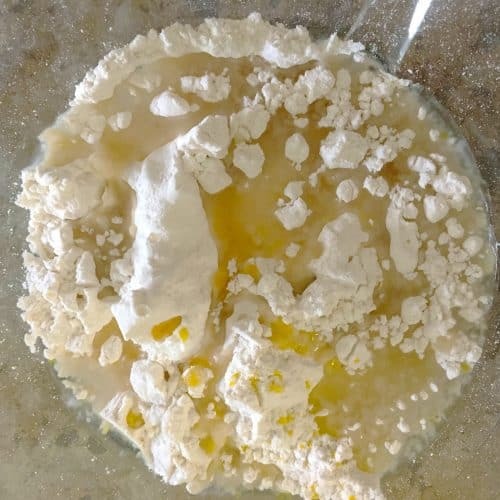 Measure out your coconut oil and microwave until it is in liquid form. About 15-20secs is all it takes. 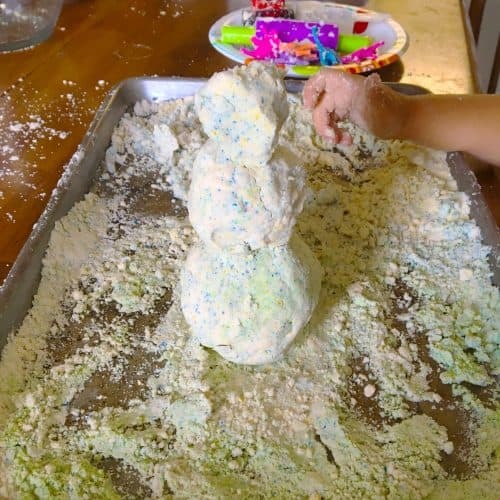 Add it to your flour mixture then add a few squirts of food coloring. Start mixing together with your hands. 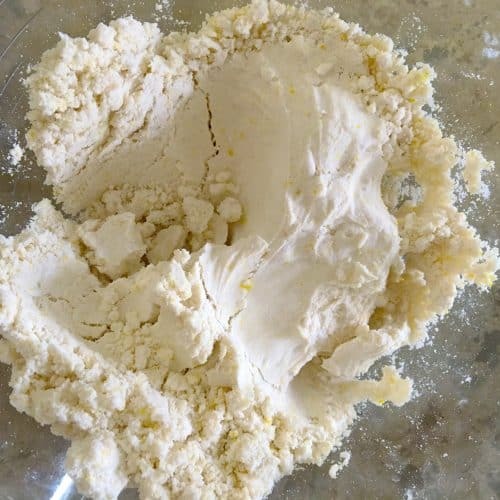 The more you squeeze it together the more the color will mix into the flour. Once you can squeeze it in your hand to form it’s done! Related: 1 bin, 3 fun sensory activities. V played with this dough for almost 2 hours straight! She loved making impressions of things. From her hands to some of her favorite toys. She really took the reigns on this and didn’t need much guidance. However, I wanted to play too. Together, we built a snowman. Volcanos and mountains were fun too. She grabbed some of her play dough toys, spoons, & scoops. It was fun to watch her play. When she was done, a recycled tub was perfect to tuck it away for the night. Until tomorrow… I am sure we will be playing again! 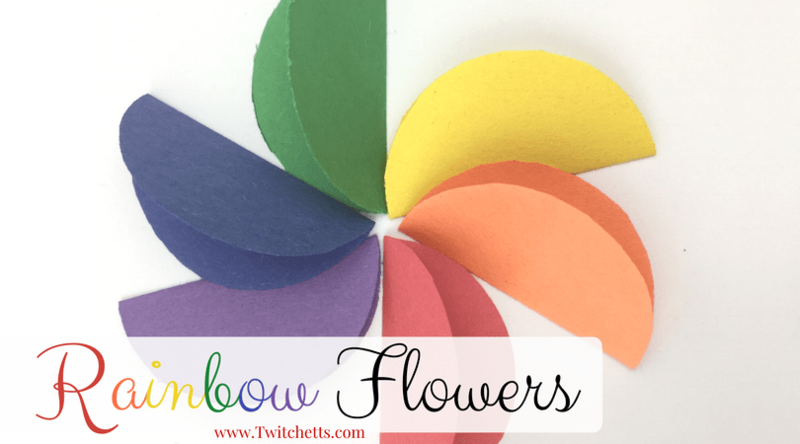 See how easy this sensory activity comes together in our quick video! 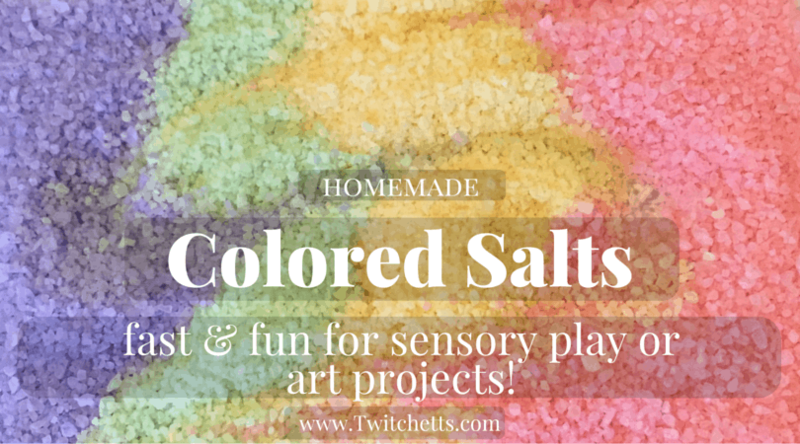 If you enjoyed this sensory play fun, please share it!